Weight Watchers has come a long way. When I first joined, back in my teen years, it was broiled fish 5 times a week and no tortillas until you reached your goal. My favorite snack was canned mushrooms, baked until completely dry and crispy, which also made them incredibly salty. Nowadays WW members can eat whatever they want in moderation. WW teaches members how to make healthful food choices and enjoy food anywhere without gaining weight. They're big on lots of fresh veggies and fruits, which is perfect for CSA members. They also create lots of recipes that look and taste fabulous. This recipe was inspired by a Weight Watchers "essential" recipe. According to WW, the recipe is just as good with turkey cutlets or white fish fillets. The original recipe calls for 2 tsp. each rosemary and parsley; we substituted 4 tsp. of cilantro, and increased the lemon to 1 tbsp. Feel free to experiment with whatever fresh green herbs you have on hand: thyme, chives, marjoram, oregano, etc. You could also try tarragon, keeping in mind that it doesn’t usually play well with other herbs. Preheat oven to 400 degrees. Coat a small, shallow baking dish with cooking spray. Season both sides of chicken with salt and pepper. Transfer chicken to pan and drizzle with oil, then sprinkle with lemon juice and herbs. Pour broth around chicken to coat pan. 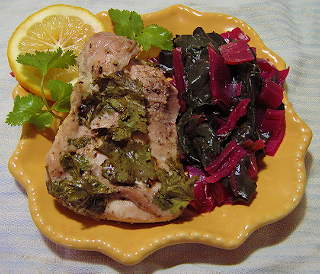 Bake until chicken is cooked through, about 30 – 35 minutes. Serve garnished with fresh lemon.